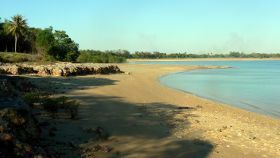 Fannie Bay Beach is part of the East Point Reserve with BBQ facilities, playgrounds and white sands next to the man-made Lake Alexander. 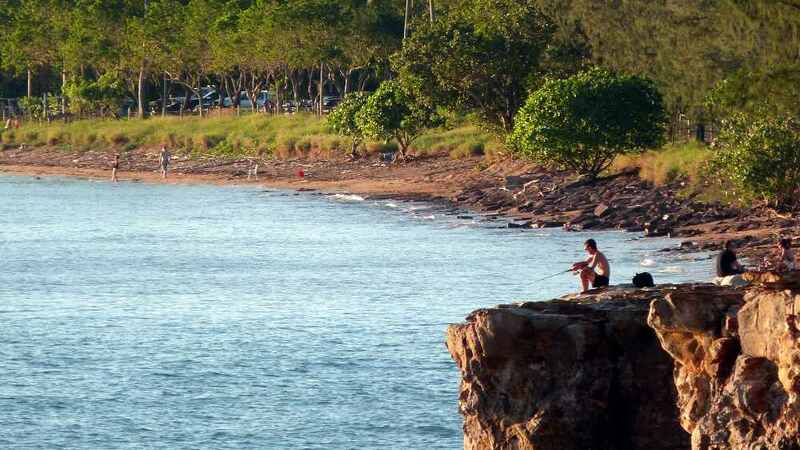 A fisherman tries his luck on a Spring Tide while Fannie Bay glows red in the evening sun. Although not a very large beach area, it is close to the city and usually has a 30-50m wide strip of white sand, except on the very high spring tides. To find the beach, simply follow the road past the Casino and Botanic Gardens along the coast to Fannie Bay. Evening on the beach boulevard. A wide grassy strip between the beach and the bike track is well provided with play equipment, garden tables and under-cover BBQ hotplates. It is a popular place for family outings, birthday parties and groups enjoying an outdoor get together. And the bike track, which continues on around East Point is always an attraction for runners and cyclists. 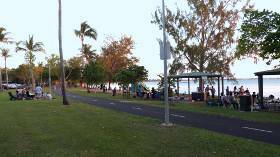 A different view of Fannie Bay Beach on an afternoon neap tide. There is plenty to do nearby too, with Lake Alexander only a stones throw inland behind the beach. 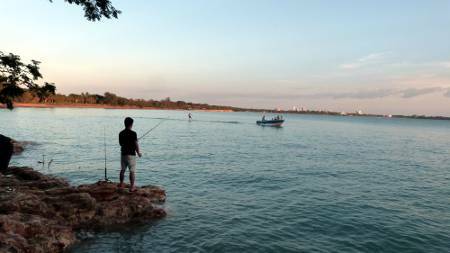 The lake water is safe for swimming even during the Box jellyfish season, and is partitioned to allow kyaks and small boats in a separate area. Leading off from the Lake Alexander carpark is a walk through the mangroveswith a built up aluminium boardwalk providing access deep into the tidal mangrove forest. East Point Aero Modellers Club uses the open spaces of East Point for their model planes and choppers, with visitors welcome to visit on a Saturday or Sunday afternoon. The entrance to the club is well sign posted, on the right hand side just past the beach on Alec Fong Lim Drive. The East Point Headland was an important part of the War Defenses in Darwin and was never developed after the war. The Darwin Military Museum and scattered concrete bunkers and gun emplacements can be seen further around the headland. Another fisherman tries his luck off the rocks. Return from Fannie Bay Beach to Enjoy Darwin Home.